Whether a writer is after something historical, scientific, cultural, or trivial, it’s easy to fall down the rabbit holes of research. Let our authors tell you about the places they’ve gone for a single reference, as well as tips on how to do effective research. Worldbuilding is more than just inset maps. It’s about economy, culture, politics, food, entertainment, modes of transit, class structures, gender roles. Panelists talk about creating worlds, and how much they know that doesn’t ever make it to the page. Check out the rest of schedule! See you there! 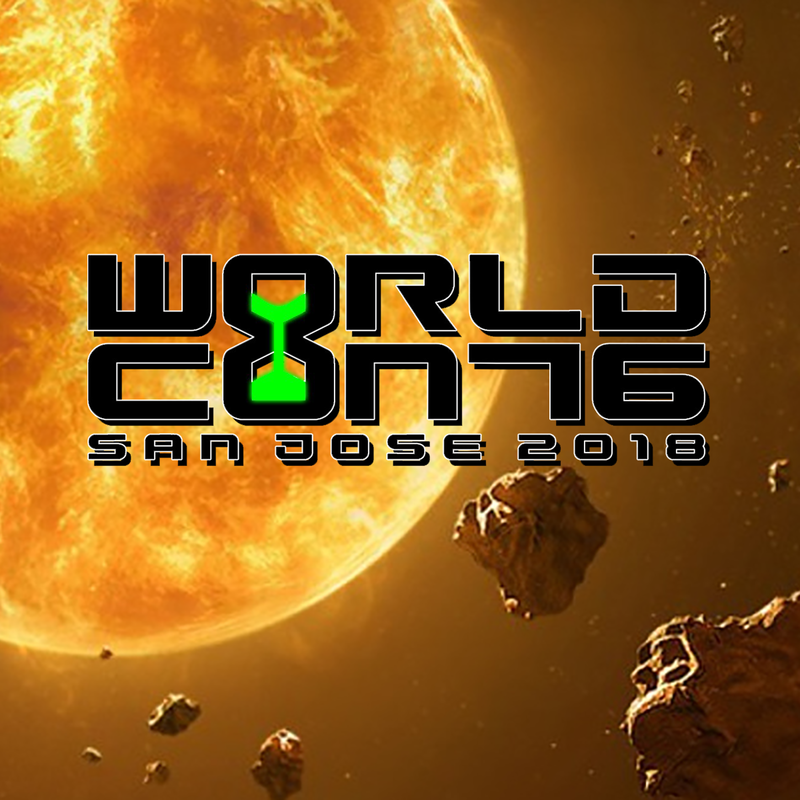 See you in San Jose — Worldcon! Here’s where to find me at Con Jose Aug. 16-20. Bay Area peeps: this means you! Sometimes, main characters in a story are ordinary people – not everyone is extraordinary. Can such a focus make a story more powerful? What makes them appealing? How does such a story differ from a story of heroes and villains? Stop by and I’ll sign promo materials for T-Rex Time Machine (my interactive fiction game) or any magazines or anthologies you brought with my stories and/or articles. Many, many Clarion classes come together to celebrate fifty years of the boot-camp for writers that launched so many careers. Mine included! Dive into Worldbuilding is throwing a party. Juliette Wade and others will bring foods inspired by fiction. Author attendees will be invited to read food-related snippets from their work. I’ll be part of a panel discussion of what science fiction can learn from archaeology this Saturday at 4 p.m. Also on Sunday from 1-3, I’ll be signing autographs along with a great many other writers. Check out all the events here. See You at the Baltimore Book Festival! 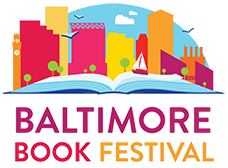 This weekend, I’ll be at the Baltimore Book Festival (Inner Harbor), in the SFWA tent, talking about human adaptations, science fiction and dinosaurs! Hope you’ll drop by if you’re local and have a listen. Come find out about my forthcoming project: an interactive game featuring dinosaurs and you. Plus there are so many other great panels at this 3-day event (Fri.-Sun.). It’s free! From the zombie apocalypse to invasive government to zero gravity to uploaded consciousness, our panel discusses humanity’s ability to adapt to new environments in fantasy and science fiction, and the resilience of the body and spirit. From eclipses to eoraptors, we’ll talk about great science in fiction. May the facts be with you! 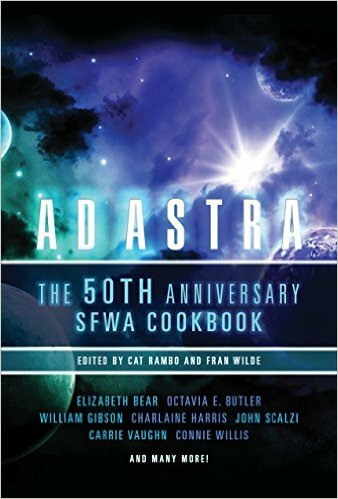 I’m thrilled to report that I have a recipe in Ad Astra, which is the SFWA 50th Anniversary Cookbook. It’s just come out and looks delectable. Who knew that so many fine writers have a culinary trick or three up their sleeves? And wow, I can say that I’m sharing a table of contents with Octavia Butler, John Scalzi, William Gibson, Charlaine Harris, Connie Willis, Walter Jon Williams, Nancy Kress, Chuck Wendig, Pat Cadigan, Joe Haldeman and many more! How cool is that? Proceeds go to a terrific cause–SFWA’s Legal Fund, which makes loans to its writers who have writing-related court costs and various other legal expenses. Huge thanks go to Cat Rambo and Fran Wilde for undertaking the job of editing Ad Astra and making that task look ridiculously easy. Now that the literary dust has settled and I’m back from the 40th annual World Fantasy Convention, I have several thoughts. First, I got to watch writers, editors, artists, and agents share the Hyatt Hotel in Crystal City, VA with a gathering of Rolling Thunder motorcyclists who annually commemorate American POWs/MIAs. When human curiosity took over, members of these groups interacted at the hotel bar and began to learn a bit about each other’s driving interest. As far as gatherings of the science fiction clan go, I’ve reached the point where there are simply more people whom I want to see at conventions than time to do so. Hence, I never really got a chance to talk to several people who were there fleetingly on the other side of a room. (Hi, guys! Hope you had a good time!) What partly made up for that was the opportunity to meet new people, and some whose work I’ve enjoyed for years. Above is Rick Wilber, who volunteered with me to cover the SFWA table, fielding questions that came our way from members and non-members, alike. Doing so was a reaffirming experience, at least for me, as I was reminded all over again that SFWA membership is a meaningful thing if one goes by the looks of longing on the faces of some writers who have yet to qualify. One highlight of the four days was the World Fantasy Awards banquet, where mistress of ceremonies Mary Robinette Kowal treated us to the sort of witty, incisive, and comforting speech that only she could give. Naturally, it was terrific to see Chelsea Quinn Yarbro and Ellen Datlow receive well-deserved lifetime achievement awards. I also enjoyed a panel by one writer friend and a reading by another, both of whom had never been on a panel or done a reading before. They were well prepared, entertaining, and generally terrific. A lovely tradition of World Fantasy Convention is that each attendee receives a hefty canvas goody bag of books. Mine came with titles by Cherie Priest, Scott Lynch, Nnedi Okorafor, Geoff Ryman, Joe Abercrombie, Jo Walton, and Chelsea Quinn Yarbro. So now the pleasant decision becomes which to read first. This is one of my favorite times of the year to be a science fiction and fantasy writer. It’s time for members of the Science Fiction and Fantasy Writers of America (SFWA) vote on the Nebula awards. Because I’m a voting member of SFWA, I read all the nominated novels, novellas, novelettes, and short stories. Not only is the quality of the nominated works awfully high, but this is a great way to discover intriguing authors whose work I haven’t read before, and to find out what some of my favorite authors have been up to recently. Soon will come the hard part – deciding what to vote for. One more thing – A good number of the shorter works have been made available to read for free on the authors’ or publishers’ websites while they are up for consideration. So you don’t have to be a SFWA member to read some of these fine stories. Whenever I attend the World Science Fiction Convention or Nebula Weekend, I go to the Hugo or Nebula award ceremonies. Not only do I invariably have friends and mentors who’ve been nominated, but I always vote and tend to feel passionately about the merits of particular works. No, I won’t tell you, my dear readers, which works from years past or present that I feel were overlooked for the win, or not even nominated. You can certainly find such opinions on many other blogs, and if you’re reading this, you probably have your own ideas. But what I can talk about is the emotion in the room when winners are announced. There is nothing in the world like hearing the cheers for a writer or editor who has poured heart and soul into a work, and had major doubts and been stymied along the way, who is then so richly rewarded. Someone asked me this year which is the “bigger” award – the Hugo or the Nebula, and I found it a hard question to answer. The two awards are given out by different groups. 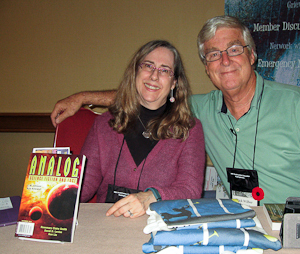 The Hugo is voted on by supporting and attending members of the World Science Fiction Convention. They tend to be readers, writers, editors, agents, gamers, costumers, and others with connections to the field. The Nebulas are voted on by active members of the Science Fiction and Fantasy Writers of America, and they are professional writers. So it largely comes down to the difference between recognition by ones fans who read one’s work and recognition by one’s peers who are also writers. Since I write about imaginary stuff, I got to wondering what would happen if a writer were to rub a magic lamp and the genie gave the writer their choice between winning a Hugo and a Nebula award for a particular work of fiction. If the writer could only pick one or the other, which would he or she chose? Well, I suppose if he or she already had one of those awards but not the other, the choice might well be the one the writer does not have. But what if he or she has neither or both?